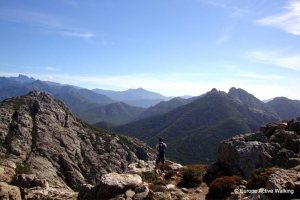 One of our easier walking holidays, the Sea and Mountains has been designed for those who wish to discover some of the most stunning sights on the island whilst having the luxury of staying in only two locations, Corte and Calvi. This tour offers a real diversity of landscapes blending high peak mountains and breathtaking coastal scenery without the stress of packing every day. You can set your own rhythm on this holiday – venture out on circular walks from both Corte and Calvi or take a break from walking and spend a day or two on the beach, the choice is yours. Highlights of the tour include the superb Tavignano gorges and its natural rock pools, the Restonica valley with its spectacular mountain lakes, the dramatic Revellata peninsular and Notre Dame de la Serra set high above Calvi. After flying into Calvi, a transfer will be arranged from the airport to Corte. Settle into your hotel in the afternoon and enjoy dinner at an excellent local restaurant. Overnight: 3* hotel in Corte on bed & breakfast with dinner arranged at a local restaurant. After breakfast, a taxi will pick you up and take you to the shepherd's hut at Grotelle, where you will start your walk. After an ascent, you will reach a small plateau that marks your arrival at a new shepherd's hut, which in the summer season sells its own cheese. Continue to climb until you reach the lake Melo before continuing on to the lake of Capitello. Return back to the shepherd's hut at Grotelle where Theo will make you try the local charcuterie! 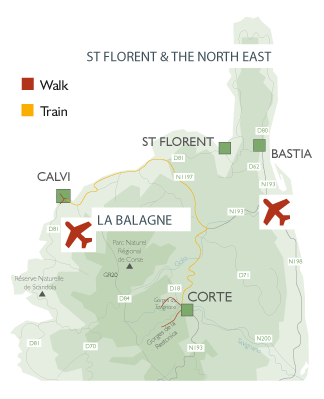 Take the train in the morning or enjoy some more time in Corte and depart in the afternoon to Calvi. The choice is yours. The train will cross some fantastic scenery before reaching Calvi, your home for the second half of your trip. Calvi is a charming seaside town, with a lively centre during the summer. There is an old citadel and a small port lined with bars and restaurants, plus you can spend some of your time relaxing on the beach and swimming in the sea or the hotel pool. Dinner will be arranged in the centre of town. ​​​​Overnight: 3* hotel in Calvi on bed & breakfast with dinner arranged at a local restaurant. After breakfast, you will begin your walk from the foot of the citadel and the monument to Christopher Colombus. Your walk will take you south along the coast and onto the Revellata peninsula. You can enjoy bathing at the various secluded little beaches on the peninsula before reaching the lighthouse. From here you can return to Calvi along a path on the top of the peninsula. Enjoy a free day exploring the charming town of Calvi. Spend time relaxing on the beach after your active trip or venture into the citadel and marvel at the views. You will then be collected from your hotel and taken to the airport at the time advised by our representative. This is a very varied week of walking that takes in the mountainous interior, the coastline and the contrasts of this intriguing island. The walks are on good footpaths and trails although terrain is often rocky and rarely flat. You need to be used to walking all day and take regular exercise to enjoy this holiday. There are many uphill and downhill sections. We describe this walk as moderate with strenuous sections and encourage walkers to use two walking poles. The paths are well trodden and way- marked but you still have to be attentive to your maps. There is also the option not to walk each day if you are looking for a slightly less strenuous trip.